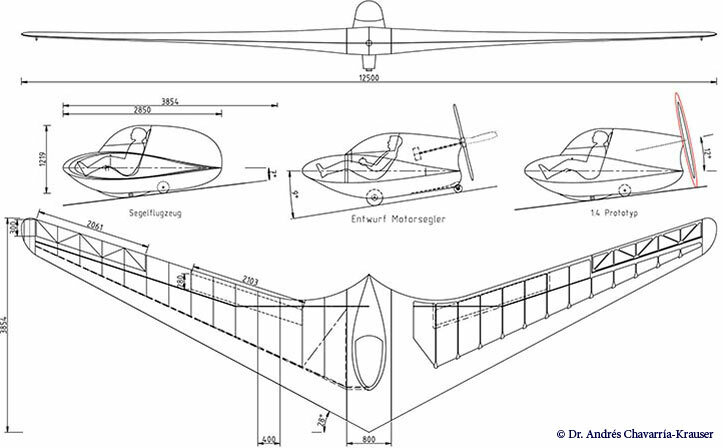 Blog Snow White – an Electric Flying Wing or a Lifting Body? “Schneewittchen (Snow White) is designed to fulfill the requirements of LTF-L, a class of very light airplanes with up to 120 [kilograms] (264 pounds – 10 more than U. S. Part 103 limits) empty weight. The requirements are quiet stringent, including not only the extremely low empty weight, but also a very low stall speed below 55 km/h (corresponds to 30 [knots] or 34 MPH).” The stall speed is still six mph faster than Part 103 rules allow. Snow White’s all-wing configuration suits this class well, according to its builder. Its thick center section, which could be seen as a lifting-body layout, allows lighter spar weight and light empty weight. He explains, “To keep the weight as low as possible, I decided to use an electric drive (for example a Geiger HPD 10), as accumulators (batteries) do not count to the empty weight.” Maximum speed with this powerplant will be 110 kilometers per hour (68.2 mph), a bit over part 103 limits. Cruise will be a leisurely 74 kilometers per hour (46 mph). and rate of climb 1.95 meters per second (384 feet per minute). The 12.5-meter (41-foot) span breaks down into four parts for compact transport, and is made of a mix of traditional-looking wooden truss ribs reinforced by carbon tow. 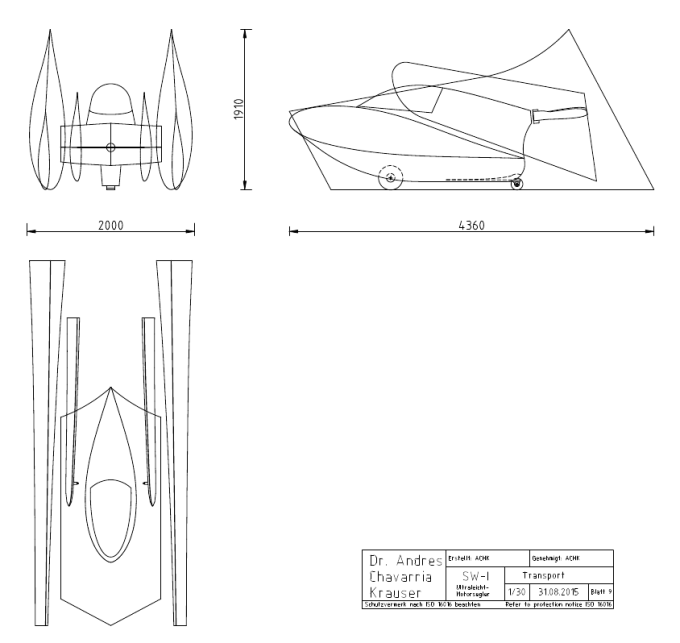 Dr. Chavarria-Krauser says, “The idea is to modify this traditional method and use carbon composites for the truss elements, in particular, the curved upper and lower profiles. These elements define the shape, which should be as precise as possible, also at loaded conditions.” With an empty weight of 103 kilograms (227 pounds) and maximum takeoff weight of 240 kilograms (529 pounds), Snow White will have a glide ratio of 25:1 at 82 kilometers per hour (50.8 mph) a sink rate of 0.78 meters per second (153 feet per minute) at 65 kilometers per hour (40.3 mph). Spars will be composed of laminated layers of uni-directional carbon cap strips to define the spar profile, a carbon sandwich for the leading edge (torsion box). 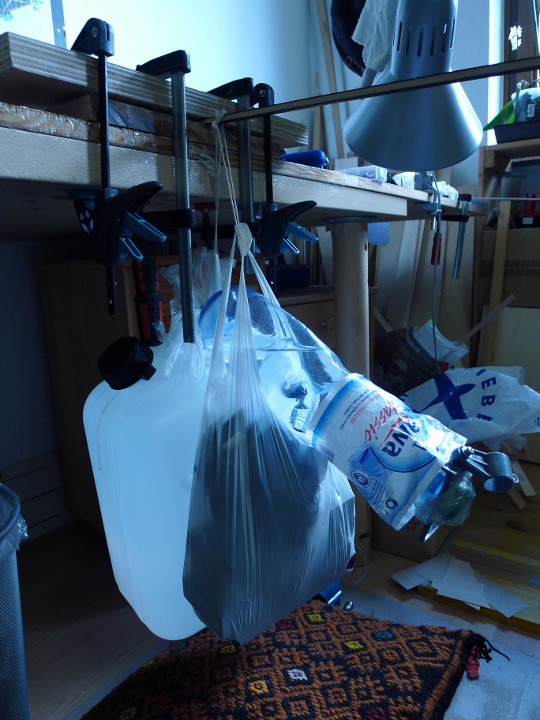 Because of the unique mix of traditional and new elements in the construction, the builder has analyzed the structure thoroughly, and followed up with practical tests, hanging plastic bottles filled with water from the test structures. 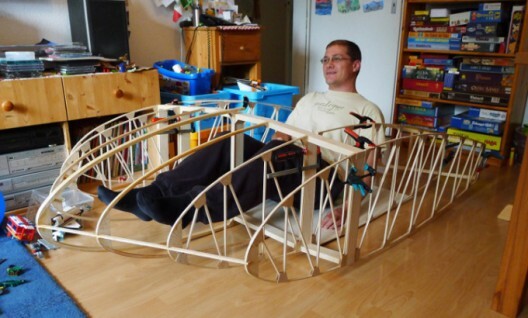 Construction of a radio-controlled plywood model, scaled down 1:4 for all sorts of flight-tests. These have shown realistic flight characteristics, with an action camera inside the craft simulating what a real pilot might see. Construction of different wing-ribs and other parts for strength-testing. Chavarria-Krauser is not afraid to break parts to find what the limits are, just like Boeing or Airbus. Construction of a full-size wing-center mockup (seating-box), which looks roomy for one and all. Not yet done, stage 4 involves building the actual flight vehicle, which by then will be well sorted out. The development of this craft shows a scientific bent of mind and a careful, resourceful approach to testing. Klaus Burkhard alerts your editor that the German “slow & light” scene is not as big as it might look. 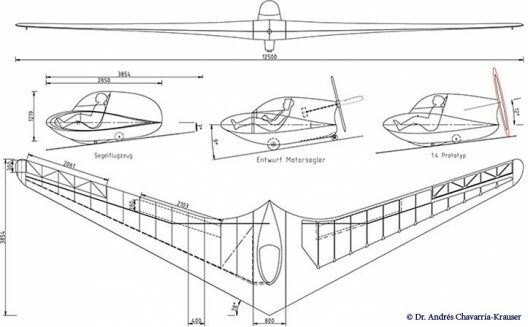 “At present, we have Germany-wide only about 800 license-holders for ultralight-soaring, compared to about 28.000 license-holders for (heavy) gliders and motor-gliders. And amongst those 800 I think, there are only 100-200 pilots flying regularly ultralight-gliders. There is still a lot of convincing-work to do.” American soaring clubs would be happy with that client base. He sees it as a “pity” that people are flying to earn OLC (on-line competition) points instead of for enjoyment. He still likes flying his Banjo, and is happy doing 50 kilometers (31 miles) on a nice afternoon. Maybe it’s just me, but a lot of the fun I get from flying is related to being able to see the ground. In that flying wing, the pilot will be able to see the sky, but will have a tough time seeing much below – even navigating by “Mark One Eyeball” could be difficult. I guess there’s fun in building an efficient aircraft, but… That one’s not for me.